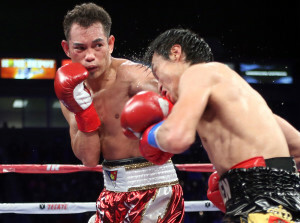 Chief among the list of goals for Nonito Donaire’s ring return was quickly working his way towards another world title shot. His first fight back takes a significant step forward in making that happen. The former four division champion from Northern California by way of Philippines is locked in for a scheduled 12-round battle with Mexico’s Ruben Garcia Hernandez. The two will collide September 23 at the Alamodome in San Antonio, Texas as the chief support to the highly anticipated World Boxing Super Series cruiserweight quarterfinal matchup between knockout artists Yunier Dorticos and Dmitry Kudryashov. Donaire sat out the first eight months of 2017 following a disappointing – and highly disputed points loss to Magdaleno in his last bout, a setback that saw his second tour as a super bantamweight titlist come to a close after just 11 months and one successful title defense. The 34-year old boxer-puncher claimed titles at flyweight, bantamweight, super bantamweight and featherweight amidst a 30-fight win streak spanning more than 11 years, a run that also included Fighter of the Year honors in 2012. He let his promotional contract with Top Rank expire before resurfacing with Ringstar, with the promise of quickly making his way back to the title picture. That wasn’t the only reason the California-based promotional outfit signed him, though. “Nonito Doniare is a fantastic fighter, he’s one of those fighters who is never in a boring fight,” Richard Schaefer, chairman and CEO of Ringstar Promotions explained to BoxingInsider.com. “That is what really attracted me to signing him., but more importantly he is a super nice person and the same with his wife Rachel. It reminded me of Shane Mosley, whose biggest paydays came while we were both with Golden Boy Promotions. First up is coming out on top in a scheduled 12-round bout that comes with the World Boxing Council Silver featherweight title at stake. To boxing purists, it’s just another trinket and an excuse for the alphabet organization to collect a sanctioning fee. To Donaire it’s a chance to advance to the top of the queue for the WBC title held by Gary Russell Jr., or at least have him as an option among a loaded featherweight field that also includes the likes of Leo Santa Cruz, Abner Mares and Carl Frampton. For his opponent, it’s the chance of a lifetime to not only land a title shot but also claim the scalp of one of the very best of this past generation of boxers. “I am grateful for this opportunity and I can’t wait to get in the ring,” said Garcia Hernandez (22-2-1, 9KOs), who has won seven straight since a stoppage loss to former bantamweight titlist Randy Caballero last February. “I know that I am facing a great fighter and that has motivated me to train harder than ever before for this matchup. Such a scenario would indeed upset the detailed plans Donaire and Ringstar have in place for the next year and possibly beyond. “Nonito wants to compete at featherweight, not come back just to get in a few fights,” Schaefer outlined to BoxingInsider.com. “His last time at featherweight included a world title but how it ended never sat well with him (an Oct. ’14 knockout loss to Nicholas Walters). The fact that Schaefer has a terrific working relationship with each of the aforementioned boxers made it a no-brainer for Donaire to sign with him.